Even in the ranks of men’s jewelry, signet rings have always been a sign of wealth and status – a literal form of power dressing, spotted on the pinkies of anyone from kings to bankers, Popes to mobsters. So it’s perhaps a surprise that they are making comeback in fashion right now. Then again, maybe not. Pinstripe suits are back. Gold watches, too. And like those baller statements, the signet ring is for everyone these days, whether you have a hedge fund and a family crest or not. One reason is the second season of American Crime Story, which tells the story of Gianni Versace’s murder. Gianni wore a signet – it was one of his most iconic pieces, adorned with a snarling Medusa head. The brand that still bears his name re-released it recently so you can get in on the knuckle-dusting action. Whether you want to wear something as ostentatious as a gold ring featuring a snake-covered head from Greek mythology is another thing. Most men are reluctant to go for gold – or silver, or bronze, or any other precious metal for that matter. Classic male jewelry is usually a sober affair (unless your name happens to be DJ Khaled). Signet rings, however, are much easier to wear than most pieces. You don’t have to be landed gentry to slip one on. Nor do you need access to an Italian fashion fortune. 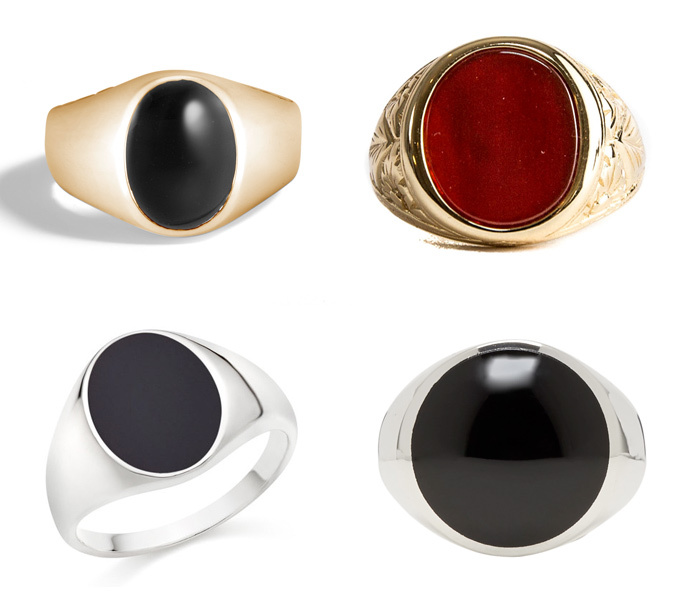 Our expert guide to signet rings proves that any man can pull it off. Where Did They Actually Come From? Once upon a time, people used to send letters. Actual handwritten, send-in-the-post letters. 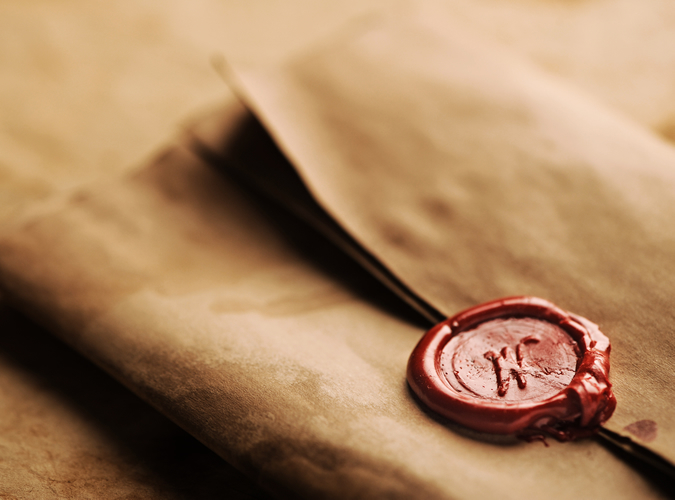 Before some genius came up with the idea of self-adhesive envelopes, such correspondence was usually sealed with wax. And for that, they needed a tool to do it with. “Signet rings – jewelry that was created with a back to front crest – were used to stamp and sign documents, and they go as far back as the 4th century BC in Ancient Egypt,” says Josie Goodbody, jewelry historian and author of The Diamond Connection. “In fact, these seals were often regarded as more notable than a signature, and Edward II ordered that all legal docs in the 14th century were stamped with his signet ring. Some of the most significant letters in history have been ‘signed’ with one to prove authenticity.” Important, especially when your surname dictated whether you lived in the palace or the pig sheds. If your mum and dad were posh enough to flex a family crest – and with it, a signet ring – chances are you were in the money. It’s an assumption still widely made today. 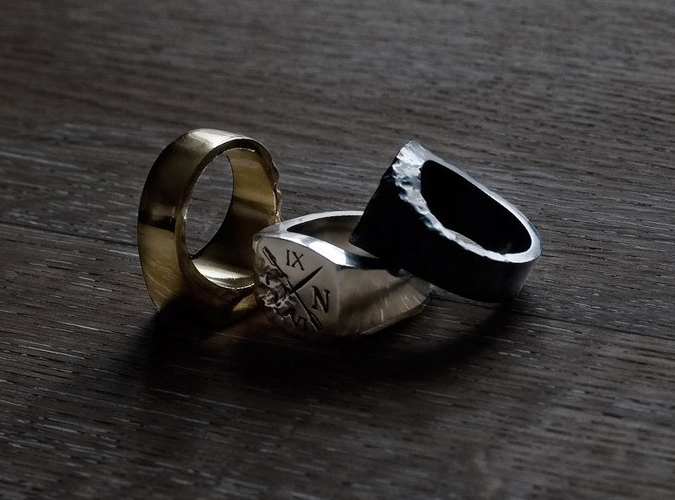 Yet despite the tradition of passing down a signet ring from generation to generation, the piece was democratized. “In the 18th and 19th centuries, people had crests made when they came into money,” says Goodbody. “Having this emblazoned upon a signet ring was a sign of what they had achieved.” Signet rings were no longer limited to old-money types. Since most of us now make our money on a computer rather than trading silks in Venice, anyone can wear a signet ring these days. “There’s little need for wax seals, and many people without a crest have settled for their initials in recent times, with the piece traditionally being worn on the ring finger.” If you do want to make like the lords of old though, Goodbody says that your pinky will serve just as well today as it did in the 18th century. Or, you can channel the circus that is modern hip-hop. 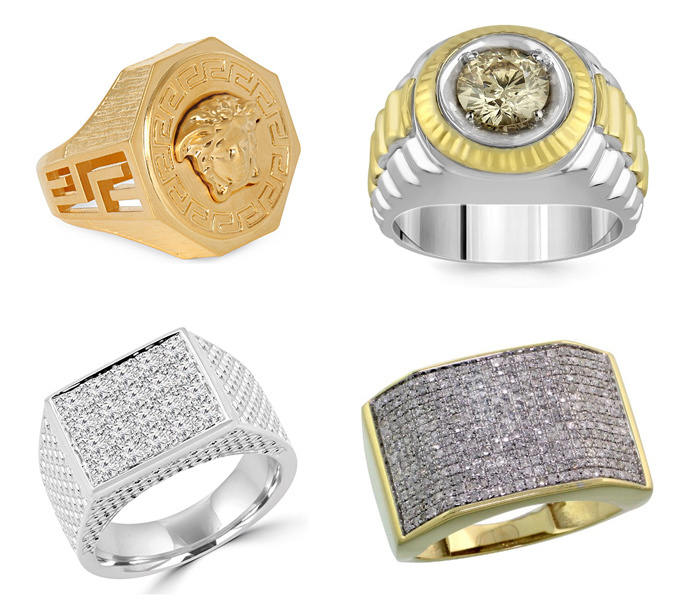 Since most rappers like to wear their pay packet on their wrists/fingers/necks, the signet ring has been co-opted by everyone from Rick Ross to Bruno Mars, and usually with a smattering of precious stones. No bad thing. The popularity amongst We The Best music and beyond is proof that the signet ring is no longer just for toffs. So too is its presence in popular culture. 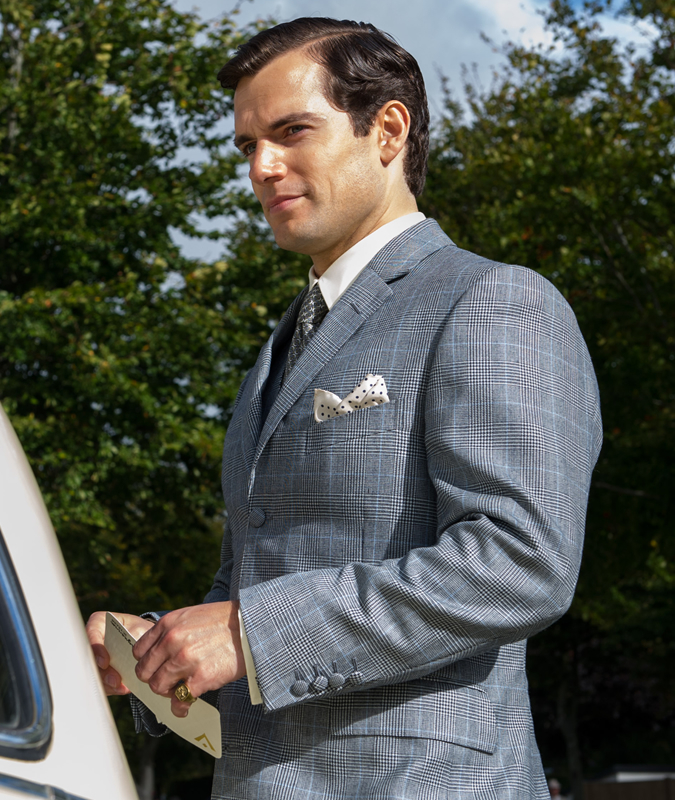 He’s no member of Cyprus Hill, but Colin Firth wore his own in Tom Ford’s stylish sob-a-thon A Single Man; Henry Cavill also sported one as slick CIA agent Napoleon Solo in The Man from U.N.C.L.E. Back in the day, Frank Sinatra wore one, as did Elvis Presley. 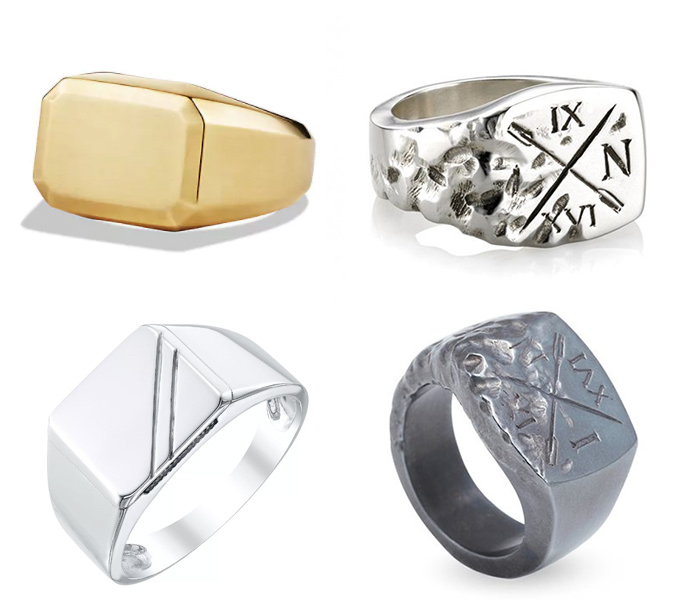 All wore more traditional takes on the signet ring, so it’s your decision who to take cue from. So, if you’re more the muted dresser, avoid knuckles full of mafia gold. Thompson also says that slimmer rings in plated gold or silver can be more minimal, and will therefore prove more a subtle add-on than a statement distraction. If in doubt, go small. It makes sense to loosen the purse strings, too. “I’d always advise to go premium with signet rings,” says Oliver Proudlock, founder of menswear label Serge Denimes. “Solid silver and gold will last longer, as will a clean simple design.” That’s not to say you can’t spend less – just don’t be surprised when there’s a tell-tale green stain on your skin. Signet rings are easy to wear alone. Slip one onto your little finger or ring finger and you’re good to go. Matching it to your other accessories is the difficult part. That’s not to say different pieces can’t work in tandem, but one slip-up can land you in Del Boy waters. There is one exception to this formula. Bi-metal watches – the ones that boast a combination of two metals on the case and strap – can be safely worn with either material. Just ensure the precious metal on your timepiece is exactly the same as your signet ring. Yellow gold is no friend of its rose gold sibling. 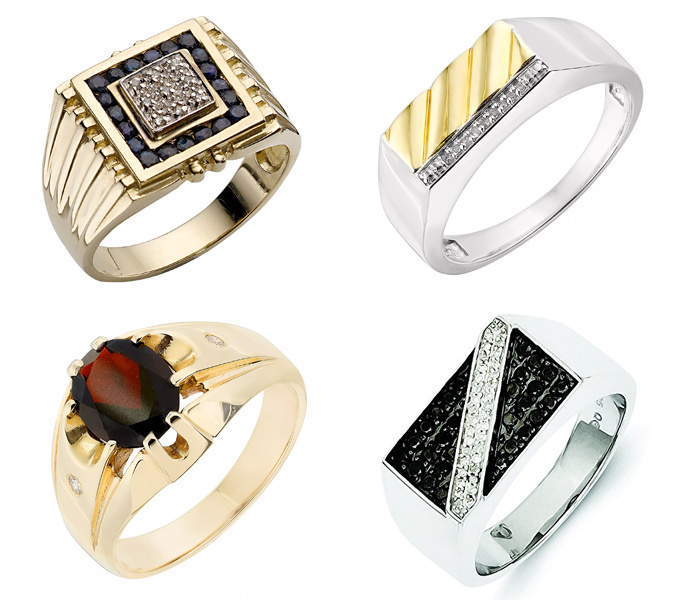 Signet rings are in themselves a particular style of jewelry, of course, but that doesn’t mean they’re all the same. Pieces usually differ in size, the style of crest and if any precious stones are embedded. It just depends how bold you’re willing to go. If the answer is “not very”, that’s fine, too – not all signet rings even boast an engraving these days. “There are no right or wrongs when it comes to signet rings,” says Thompson. “Smaller, simple designs are popular as they’re less noticeable, but added diamonds are both durable and stylish.” It’s up to you. Common choices often include a family crest, and many jewelry outfits charge a small fee to help you search for – or even develop – your own. If bloodlines and ancestry isn’t quite your vibe, initials are a popular, solid choice, as are motifs, emblems or logos. It could be something to do with a big trip, a much-loved story, even your five-a-side team badge if you care that much. It’s not hard to find somewhere that offers customization. Hatton Garden jeweler Rebus is one brand to offer a bespoke service from start to finish, consulting with you every step of the way for the perfect signet ring. It’ll undoubtedly cost more. But you’ll own a signet ring tailored specifically to your tastes. 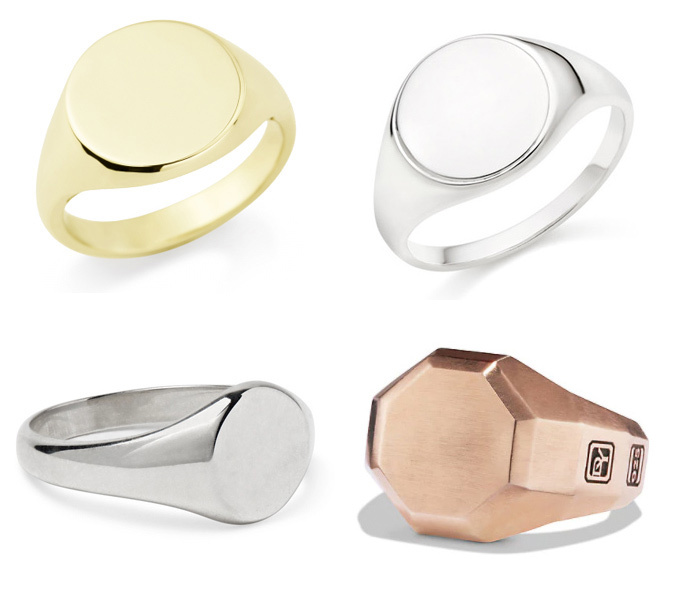 The short back and sides of signet rings. A round or oval ring is classic, easy-to-wear and suits almost every personal style in the book. It won’t set the world on fire, but that’s most certainly the point if you’re a muted dresser. Seems you can circle a square. Squared signet rings, in which there’s a rectangular front as opposed to a rounder one, is a subtle pivot from the norm, without radically changing what a signet ring is. Precious stones needn’t mean rubies, emeralds or some other bling that could blind a small child if the light catches it. Moderately lustrous rocks – like polished agate – are a simpler alternative that’ll chime with your watch and your wider wardrobe. Most guys only opt for one precious stone. Diamonds are expensive, not to mention difficult to pull off. Should you boast the swagger of a Don Corleone in Vegas however, throw caution to the wind and enlist several. And probably contents insurance, too. If you see green at DJ Khaled’s stone-encrusted knuckles, then you sir, are ridiculous. But you have our utmost respect if you’re brave/rich enough to rock a bona fide finger cannon.